Rich: Steve Dotto is Canada’s most respected geek. For over 15 years as host and executive producer of Dotto Tech, a nationally syndicated TV show. Steve has entertained and educated millions of Canadians on all aspects of technology. YouTube is Steve’s new network of choice, where he serves 2 communities, a traditional “how to” and productivity stream – which follows his TV tradition – and a new focus on learning the keys to growing and ultimately monetizing a YouTube channel. Steve, welcome to the show. Steve: It’s a real big honor for me to be here. Rich: Awesome, I appreciate you taking the time. I’m kind of curious, you were doing the broadcast thing, how did you move from broadcast to YouTube? Steve: Well, my TV show was a “how to” computer show. Back in the day, we showed you how to flash your modem to upgrade from 26.6 to 50 kB per second. So that sort of content broadcast on national television is questionable value this day and age. So about 4 years ago our show reached its “best before” date, and we stopped doing the show. And to be fair, the whole broadcast space was being changed and completely disrupted by YouTube and the online community. Now I didn’t immediately decide that I was going to go into YouTube. I kind of wandered in the wilderness a little bit trying to figure out what I wanted to be when I grew up. I had been doing broadcasts for 25 years, I was ready for a change. YouTube eventually drew me to it. The biggest thing about YouTube for anybody coming from a traditional medium background or traditional broadcast background is the direct connection to your audience, which you never had. Content creators in television have access to the network or their sponsors, they don’t have access their audience, So suddenly having access to your audience and having your audience become your real customer, that was an epiphany. So that started about two years ago for me. And once my eyes were open to that potential I got excited, because I could have relationships with new people, and I could basically try and recreate the success we had on network TV and try it on YouTube. The other big surprise is I thought I’d be just significant in Canada where my show had aired, but in fact now the Canadian marketplace is only about 7.5% of my overall audience. You grow internationally, which has been another eye opening experience for me. Rich: That’s great. And I can barely even tell that you have a Canadian accent anymore, so there’s that. Steve: It’ll come, it’ll come. Rich: I am also a big fan of YouTube and online video marketing, but there seems to be this barrier of entry for many small business owners. So I’m sure you’ve heard this before, people don’t have the time or know how or they don’t have the camera to do online video marketing, what do you tell them? Steve: You know what I think it is? I think it’s none of those things. I think if we really boil down and sit down and lay them down on a couch and ask them what they fear is, the size of the marketplace and making YouTube measurable. Because YouTube is so vast and the numbers for success seem to be so huge, that the average small business person doesn’t see how they fit in that equation. They don’t see how their product is going to fit with millions of views, so consequently they disengage. They just feel it’s too vast and they’re going to get lost in all of that noise. What they really need to understand – and the most important thing to respect with YouTube – is that every person viewing your YouTube video, it’s an intensely personal experience for them to be viewing that video. So it’s actually a much more intimate exchange than you think. Just because the marketplace is vast doesn’t mean that the connection is not intimate. So for most of them, the will isn’t there to overcome any of those small, technical hurdles in this day and age because they don’t necessarily understand the engagement value that YouTube will bring to the table. I think if we can get past that, then all of the technical things can fall into place pretty quickly. Rich: Alright, that makes sense. So when you or when anybody is sitting down to decide what they’re going to make a video about, what are some of the basics for creating valuable content and where do you come up with your ideas? Steve: Well for me it’s a little unfair because I’ve now built a community where people are telling me what they’re interested in. So paying attention to what my customers or viewers are saying is kind of #1 for me. Seeing how different videos perform and then kind of following that theme. I think for the average small business person, as they’re looking at establishing some sort of a business strategy, the thing that they are probably going to really consider is what’s the stories that they tell the most. What are the things that they say over and over again to their customers or to their clients or to their staff or to whoever it is that’s their constituency that they’re thinking about delivering this content to. And once you come up with what those stories are, figuring out how that narrative is going to fit in video will give you the path that you want to carry through. The thing is, you can’t be too concerned about the success of any one video or not. 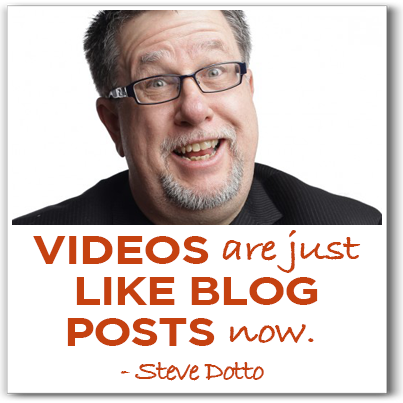 Videos – for me – are just like blog posts now. You’ll write a blog post, I bet, that you realize is not going to reach a large audience, but it’s something that is important for you to share and important for you to document and to have that there to maybe refer back to in the future. And videos can perform the exact same function. They are a richer, more vibrant form of a blog post. A lot of us aren’t great writers, a lot of us find writing to be an arduous task, and when we start layering in the extra communication models that we have in video – especially if you use desktop video with a simple webcam to record your face – being able to add your voice and inflection. The raise of an eyebrow, the tilt of the head, the smirk or the frown. All of those things just constantly add context to our content as we’re delivering it, which makes it that much more rich, more valuable and that much easier for our audience to consume. We’ve become a video consumption society. We communicate far better in video than we recognize, and it’s almost become second nature. Coming from the TV industry, there’s a lot of hubris in the TV industry that nobody else can produce. The kids are producing great video on YouTube and you and I and our colleagues are producing wonderful video, if they’re paying attention to their content and are good communicators. So the whole idea is just basically getting inertia on your side, put them out and then start to build it. It’s almost like the field of dreams, build it and they’ll come. But the first stage is to start building and start recording and to get the first bits of data up online and ready to publish. Rich: Steve, I think that’s great advice. I just want to reiterate something that you said, maybe 2 things. One is, don’t worry about the success of just one video. And that’s so true, and I know that a lot of people when they get started on any platform are so timid that the entire world is going to see this one tweet and judge them on it. That’s just not how it works, especially at the beginning when you literally have no audience, you don’t have to worry about screwing up so much. And the other thing you said – and I’ve said similar things – treat your videos almost like blog posts. You’re creating an army of videos out there and that army is going to do your bidding and help you reach your wider audience. So don’t worry about the performance of just any one video or blog post. Steve: And let’s take that a step further, let’s take it into your own performance in the video and how you produce. You and I just came back from Social Media Marketing World, and one of the overarching themes of that conference was context. They kept talking context. All of us are going to take away context into our own space and kind of internalize it. When I took context away from that conference – here’s the way I see it play out – there’s so much content online that everything I say has been said by somebody else, and they can find it because of how powerful search is. My audience doesn’t care about that. My audience wants to see the same content that somebody else might be sharing, but they want to see it through my lens. They want me to provide the context that puts it in place for them. It’s part of their consumption process. That’s the value that content creators have in the marketplace, is providing context to something which is already there. A million people show you how to use Evernote. Why do you follow me? Because they like how I show them how to use Evernote. And part and parcel of that is my personality coming forward. I’m not polished, I’m not clean, I’m not perfect. If we consider how we like to consume video, we don’t want to see someone there letter perfect staring at the screen delivering the content like it’s a speech and they have an iron rod shoved up their tookus. If they stumble, if they make a mistake, if they rephrase themselves, we want that because it’s an organic connection that we have. Don’t worry if your videos aren’t perfect, don’t worry if you misspeak and then correct yourself. Let your personality come forward, because that’s what creates context, that’s what creates a real engagement with the audience. Rich: And also, your personality is one thing that your competitors cannot really steal from you. It’s always important to put your voice out there, even if other people have said similar things in the past. Steve: Yes, absolutely. It’s not about that, it’s about the connection, And video is the best place to have that. In my opinion, it is the best place to have that. Rich: I think a lot of us would like to get as big an audience – and obviously valuable audience – and a well qualified audience, but we want to get more people watching our videos. What do you do, step by step, to get more people watching and engaged with your videos, Steve? Steve: It’s not rocket science. It’s actually straightforward, good, social marketing. All of the things that you teach in this podcast and we learn from other social media specialists come into play when we start to position them with YouTube. The big thing to understand about YouTube is it’s a social network it’s not a broadcast platform. It’s a social network first and foremost. And that all changed 16 months ago when YouTube changed the rules of engagement in the community section from being able to post anonymously to having it attached to a Google profile of some sort. The comments area is essential. So for me, the most important part of growing my community, is my community knowing that I’m actually part of that community, that I’m willing to be a leader in that community. So every day begins the same way for me now, in social media. But I don’t spend time on Twitter, I don’t spend time on Facebook, my social media platform of choice is YouTube. I go into the comments area and I respond to each and every comment – every single one – on my YouTube channel. And I think that alone, one person at a time, has grown my channel. To give your audience some context, when I started nearly 2 years ago I had nearly 800 subscribers that were leftover from my old TV show days, and today we’re closing in on 72k subscribers. So is that a big number? No, Is it a big number? Yes. That’s the thing about YouTube, you have to measure your success based on your own criteria and not on somebody else’s. There’s lots of people with way bigger markets than mine, and there’s lots of people with way smaller, and they’re all valuable because I got my community that I’m supporting and that’s #1. It’s one community that I support and that’s important to me. So I’m the exact same size as everybody else because I have my community. Rich: I like that, that’s very cool. And that’s great for getting more engagement, absolutely. But let’s say we want to get found, we want people to search us on YouTube. Teach me some of your ninja SEO tricks when it comes to YouTube search. Steve: Here are the most important criteria for making your video found in ranking and search. The first most important thing is to understand the contract you have with YouTube. YouTube is a simple partner. They want you to produce content that you say you’re going to produce, so the title is the most important, single factor in being found. It’s reflecting what’s in the content of your video is #1. When YouTube sends somebody to watch a video, they watch very closely to see how it performs. They want to see that that person stays on that video for a good percentage of time and they especially like it when that person responds, either thumbs up, thumbs down or comments. It doesn’t really matter, they want to see a response to that video or even a subscription. All those things mean that YouTube assumes they were correct in recommending that video, in search or in their recommended YouTube videos, and they’re likely to do it again. It’s building trust within the YouTube franchise, that’s #1 we have to pay attention to. I don’t worry about length of video. People say, “You should make your video 2 ½ minutes. It can’t be more than 3 minutes on YouTube or you’re dead in the water.” That’s a load of crap. You make your video the length it needs to be to tell your story. If you’re like me and you do “edutainment” rather than pure education, then your video is going to be a little bit longer because you’re going to be adding little asides and humor here and there to keep engagement going which takes a little bit away from the content, but it works in my space. So don’t worry about the length but worry about the content. Deliver exactly what you say, don’t promise something because it’s going to rank well in search and then not deliver it just to get the view. You have to be an honest player. Once you’ve done that and gotten the decision that’s in the content of the video – creating great content hs to be a given – then your title is the most important factor. In the title, keywords count still. Old school SEO counts, but you want it weighted towards the front of the title. Because if your keyword if you’re doing a video on Evernote, get the work Evernote in the first 2 words of the title, because that’s what’s going to rank and search. Don’t worry about your branding, don’t even put your branding in the title, it will never rank in search. The next important thing is to do a good description that contains your keywords and putting them in the description. And YouTube tells us the tags are important, but I don’t believe them because it doesn’t seem to make the slightest difference, but I still do it. So tag even though you don’t see the value – add the tags. The next most important thing is what happens when the video is launched. So if you’ve created a good video, it’s well titled and it’s ready to go, then you have to prepare it for launch after you massage it a little bit to take advantage of it when it is successful. And ny that, I’m speaking of creating some calls to action within the video to get people interacting with your video. I don’t like the begs up front of telling people to give you a ‘like’ or a ‘thumbs up’, instead ask a question, “Let me know what you think about what we’re talking about, comment below.” And then honoring those comments by engaging with those comments, create some sort of natural interaction. It’s perfectly acceptable to ask for a subscription, which you can do by using annotations – which is an interactive layer that lays over the top of YouTube videos – but annotations are only available on desktop. YouTube has recently changed and given us a new tool called YouTube cards, which we’re still figuring out how to use, but they allow us to do calls to action asking people to sign up for our newsletter or subscribe to the channel or go to one of our merchant sites or fundraising site. A lot of different ways that we can engage, but make sure that you take advantage of all those engagement tools that are appropriate for your content. Once you’ve got the video ready to go and published, the next most important thing – as far as I’m concerned – is creating a good thumbnail. I don’t like just taking an image from the video and using that as a thumbnail, especially not if you’re brand building. Because when people search, they’re going to start seeing a whole series of videos listed in YouTube, and in the sidebar when they’re watching you want your videos to be identifiable to start to create some social proof immediately. That way even if they’re watching somebody else’s video, the fact that you’re appearing in the sidebar or you’re appearing in search regularly with your branding included, then that creates the social proof and trust and eventually people are going to click on it. Over 50% of my new views come from YouTube suggested videos. One of the big reason I think is because I have consistent branding on all of my thumbnails. They see this Dotto guy there so many times that they just think that I‘m part of the infrastructure no matter what. And eventually they click on me and watch me and decide whether they like me or not. Rich: So let’s take a pause right here because I want to recap what we’ve got so far. So we create this video, we make sure we give it a good title with our targeted keywords at the front of the title. Now it sounds like you actually changed your titles midstream after a little bit of testing. So we can change our titles, we can go back and take old videos and refresh them with new titles. Is that what I’m hearing? Steve: The only thing you can’t change is the video itself. So definitely refresh the titles, give them a little spray of Febreze and freshen them up if they’re not performing. Rich: Nice. Next we want to come up with really good descriptions, again getting our keywords in there. You say you’re not sure about the tags, but still put your keywords in there. One thing that I’ve heard about the tags – but I haven’t done enough testing to be sure about this – is if you keep on using your branding in the tags, that that influences the suggested videos. Which will give you a better chance of having your videos as suggested videos rather than your competition. Again, I haven’t tested this, but one of the YouTube newsletters that I belong to mentioned that. Steve: That seems very reasonable and that is a good reason. I almost forget to add it so I’m making a note myself. Rich: Also have calls to action to get your audience to engage and have kickass thumbnails. For example, I was checking out Steve’s YouTube channel before we got on the call today and I suggest everybody who is listening in today go over and take a look at Steve’s YouTube channel for a great example of how to create thumbnails for your videos. Steve: The first 24-48 hours of a video’s existence is crucial. If you can generate momentum right out of the gate, you’ve got a real advantage. One thing that we all need to respect and understand about our video is that even though we create a good video, the YouTube gods are not going to smile upon us and give instant viral success. It doesn’t happen that way. What happens – if you created great content – is the start of the work. We often think we created a great video and that’s it, job done. You have to shine a light on your own content, you have to push it out there, you can’t rely on anybody else. So the first thing that I do as soon as I publish a video, I write a good description, I post it to YouTube – of course it’s cross posted to Google+ – I go and I comment, and then I take my post and I cross post it immediately to my own blog. Because at the end of the day – although YouTube is a great partner – they aren’t me. I want the content to live on my blog, I want to drive people to my site so that I can ultimately ask them to sign up for my newsletter and get on my mail list. At the end of the day, I still need you on my list in order for me to consider that video to have been a success and converting you into one of my followers. Even though you’re a subscriber, even though you comment, even though you’re engaged in my online community, I want you on my mail list. That’s where success starts. So I post that video into my blog and do the call to action and have you subscribe to my newsletter. I also get the addition proof and authority from having lots of views of the video on my site, and then I take that blog post that I’ve created on my own blog site and I cross post that into all the other social platforms, starting with Facebook but making sure that I’m referring back to that post in all of the other platforms. And then whatever you can do to support it. If you want to do paid promotion of posts, go ahead. Spend money and promote your post on Facebook. If you’ve done that make sure that your thumbnail is Facebook friendly, so less than 20% text. That’s something you kind of have to plan for in advance. But now start pushing it the way you would push any other great piece of content out into the marketplace. Inviting your friends to have a look at it, whatever it takes to shine a light on that content, that’s your job for the first 48 hours or so of that video. Comment on it, reply to every comment and just support the heck out of it. Rich: Alright Steve, so you put the video out there , you’re cross posting to Google+, your’re cross posting your blog. When you get to social and you start sharing this, are you sharing the link to your blog, to Google+ or to YouTube? Steve: Always to my blog. Rich: Always to your blog, ok. And you’re doing that because you want to build your own email list, not necessarily just generate subscribes for your YouTube channel. Steve: Yes. Untimately my goal is to generate subscriptions to my email list. Then they’re part of our business. That’s when they can become a customer rather than just a viewer, right? Steve: And here’s one thing that I have been playing with and I don’t know if it’s benefiting me but it seems to be working – although the Google+ community is a little split on it – but instead of just posting my YouTube embed code from my YouTube feed on my blog post, I started posting an embed code you can grab from Google+. If you go to your Google+ post, you can click on the carat and grab the embed code and then embed in your blog post. And then the whole Google+ post, all of its social proof comes in as the post. I’m thinking that that is kind of doubling down on authority for the fact that now it’s seeing the Google+ . And if they’re watching the video, now I’m getting the Google+ play as well as the YouTube play. I don’t know if it actually works that way, but if it does, wouldn’t that be special? Rich: Alright, let me just reiterate that to make sure I wrapped my head around it. So, you create a YouTube video and share it on Google+. Then when you go to embed it on your blog you’re not actually embedding the YouTube code, you’re embedding the Google+ code, and hopefully getting the benefits of both of those platforms and all the social proof that come along with them. Steve: Exactly. Now maybe one of your people knows a little bit more about Google+ and they can comment and let us know whether or not this is just folly or if this is actually going to be beneficial, but it’s what I’m doing currently and it seems to be working but I can’t tell if it’s really working. Rich: Alright. Some of these things we never will know, we just kind of get a sense of whether we think it’s going to work or not. This has been great stuff and hopefully you have inspired a number of listeners to finally get off their tookus and start creating some videos. But I know you’ve got a lot more to share, where can we learn more about you online? Steve: Dottotech.com is my site. Come there and sign up for the newsletter, we do lots of webinars where we teach productivity and social marketing skills, specifically around video, YouTube and soon to be in the webinar space. Dottotech.com will give you a good idea of all of the sorts of stuff that we cover. We do an awful lot in the productivity space, too, around Evernote and Gmail and all those sorts of tools as well. Rich: Steve does have a lot of great stuff to offer. We’re going to have links to all of his great stuff in the show notes, so be sure to head on over there. Steve, thank you very much for your time today, I definitely appreciated it. Steve: Rich, I appreciate the opportunity to share with your audience. Thanks guys. Head on over to Steve’s YouTube channel for great productivity and “how to” advice, as well as tips for growing your own YouTube channel. Don’t miss out on all the great stuff Steve is sharing at his website, and don’t forget to sign up for his newsletter! This entry was posted in Blog Marketing, Video Marketing and tagged blog marketing, Dotto Tech, online video marketing, steve dotto, video marketing, youtube marketing by Rich Brooks. Bookmark the permalink.